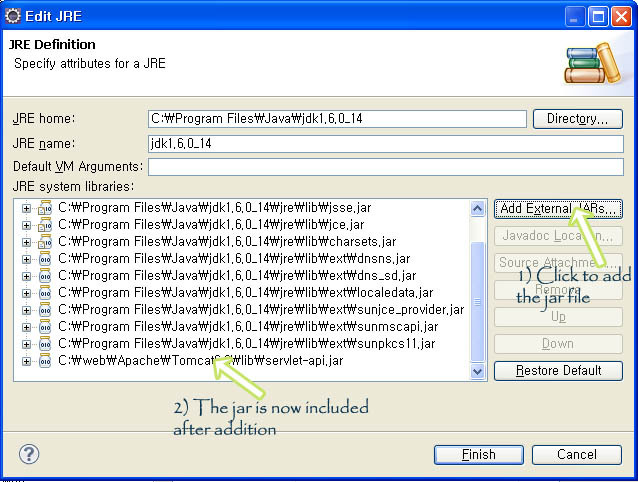 When you start to develop web application using Java, you may think to use Eclipse as the IDE. Assume that you have seen a good tutorial about Java servlet on the internet or read the chapter of a book discussing about web development using JSP. You are now writing the first servlet by using the wizard provided by the IDE. However, as soon the template file is loaded on the source code editor, you encounter the infamous error “The import javax.servlet cannot be resolved” just like depicted in the figure below. This error is normal. Servlet library is not shipped by default in Eclipse. You also can’t find the library in JRE/JDK package you download. Instead, you will find it in the lib folder under Tomcat installation directory like depicted below. In the first method, we add the servlet-api jar by right-clicking the project name and choose Properties option. After clicking, a new popup window will appear. 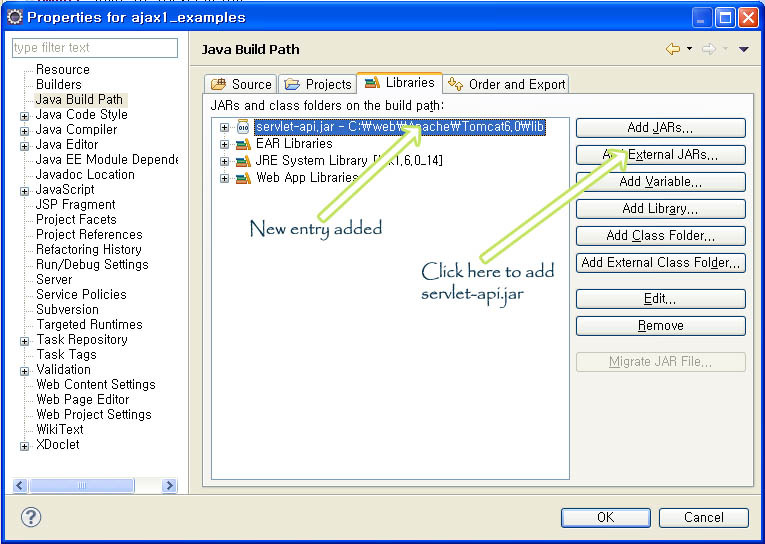 Click the “Java Build Path” menu on the left followed by choosing “Libraries” tab. Subsequently, click “Add External JARs” button and point to servlet-api.jar in lib folder of Apache Tomcat installation directory. If you do all these steps correctly, you will notice that servlet-api.jar has been added into the libraries. Please check your result with the reference picture below. Click “OK” to complete the modification. After a glance, you will notice all imports errors have been disappeared. The first method is good if you rarely work with servlet. If you yourself are a very busy developer who has to build numerous projects for your vast client base, it is considerably wise to apply the second method. In this method, we will add the servlet-api.jar into the JDK directory. After the modification, you will never encounter the error again as the servlet-api.jar will always be in the build path. This is different with the previous method which requires you to modify the project properties again if you create a new dynamic web project. 4. Click “Add External JARs” and point to servlet-api.jar in lib folder of Tomcat installation directory. After you do all the steps, all the servlet import errors in the source code editor will have vanished. You will also have discarded the import error for all projects which require the servlet functionalities. This entry was posted in Java, Programming languages and tagged Eclipse on April 24, 2010 by Tech Admin. This is reall helpful. Thank you! Thanks a lot. It solved my problem.Way to go. Thanks a lot. I was breaking my head for this,. Luckily i came across your post. Was very useful. Another way to solve this problem is to add tomcat in your preference and select it as your default server. This ensures that the servlet api would be available. This also eliminates the import issue. Thanks a lot.It is very useful.It solves my problem. Thanks for saving me a lot of head scratching. Not a java developer by trade so relying on tips like this to help me get this darn project working! Very clear explanation! It resolved my issue. Thanks Man. Great job and a huge thanks..
thanks man u did a great job!!! Seems good among all the solution seen so far…Hope it works…and thanks in advance…bookmarking U…!!! This was very helpful. I have been trying to resolve this for a long time. You do this by setting a Targeted Runtime. This is set in the Project properties. In Eclipse, go to Project -> Properties, then click on the Targeted Runtimes page. On that page, you can select the runtime (application server) your application will use. Thank you so much, really it was too helpful. Hey, thanks a lot. That was to the point and elaborately described.